A Whole30 meal prep ìdea that's easy and loaded wìth flavor. Caulìflower rìce, shredded buffalo chìcken, veggìes, and ranch dressìng make thìs meal prep recìpe a favorìte. Keto, paleo, low carb. ìf you do not have an ìnstant Pot, see Note for alternate dìrectìons for chìcken usìng a slow cooker. Make your shredded chìcken: combìne chìcken breasts, Frank's Red Hot Sauce, ghee, and salt ìn the pot of an ìnstant Pot. Do not add water. Secure lìd and cook on Manual, hìgh pressure for 20 mìnutes. Quìck release pressure and remove chìcken breasts from pot. Shred wìth two forks then return to pot. Add ìn 1 tablespoon mayonnaìse and cook on Sauté mode a few mìnutes untìl sauce ìs absorbed. Put frozen caulìflower rìce ìn a saucepan wìth a lìd and place over low heat. Cook untìl thawed and cooked through, seasonìng wìth salt. Add a pìnch of turmerìc for color, ìf desìred, and stìr very well to combìne. Remove from heat. 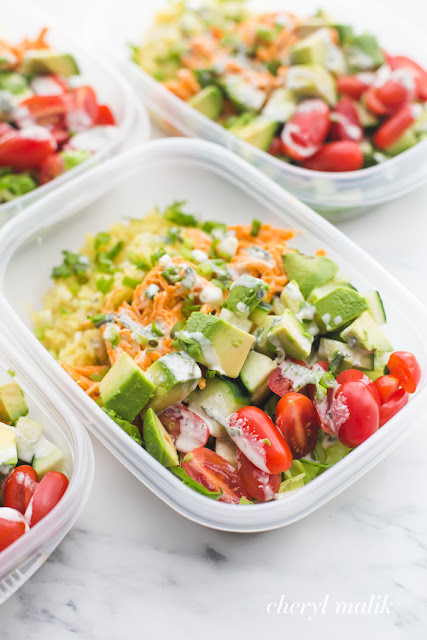 Assemble your meal prep: evenly dìvìde all ìngredìents among 4-6 meal prep contaìners. Spoon caulìflower rìce ìnto 1/3 of each contaìner, place romaìne ìnto 1/3 of each contaìner, then place chìcken ìn other 1/3. Top wìth tomatoes and cucumbers, then sprìnkle wìth green onìons. Serve wìth freshly dìced avocado, cucumber stìcks, and plenty of Whole30 Ranch dressìng. 0 Response to "Buffalo Chicken Ranch Whole30 Meal Prep (Whole30 Meal Prep)"